Running a small business requires your attention to be on growth and forward motion. Spending time going back to collect on accounts that are delinquent is a drain on your productivity and prevents you from growing your business. Some small business owners don’t bother with diligent and vigilant debt collection. They believe the effort and resources spent collecting outstanding debts would be better used to get new accounts and clients. However, you can’t ignore outstanding client debt. Business is about making a profit and too many accounts receivables can severely tax the cash flow a company requires to operate and prosper. That is why we offer debt collection services for small businesses. We help create a steady inflow of cash, encourage on-time payments with your clients and map out an effective plan to handle late collections. We are a third-party company collecting debts for small business owners like service professionals, hospitals, music and book clubs, medical clinics, plumbers, electricians and even credit card companies. It does not matter what services you offer, if you have outstanding client debt, we can help you recover those accounts receivables and still keep your client relationships intact. The Late Payment of Commercial Debts Regulations 2013 provides creditors with a statutory entitlement to claim from debtors the cost involved in instructing a debt collection agency to recover payment of overdue commercial invoices. It can be difficult to decide to hand any customer accounts over to a debt collection agency, but by choosing the right account recovery service for your business and consistently considering which accounts you can no longer wait on to be paid, you’ll be making a wise decision to keep your business running. Typically, every customer receives a reminder. When they continue to be delinquent, it’s customary to follow up with a phone call. If that doesn’t get results, handing the aging account to our agency is the next logical step. We will continue to reach out to your customer to negotiate a payment plan. Legal action is typically the last straw if the debt remains unpaid. Many small business owners find collecting on debts from outstanding accounts or customers is tedious and sometimes very expensive, consuming time, human resources and even money. No matter what’s required to collect the debt, you do need a small business collections partner to work with you and your customers to negotiate payment arrangements while maintaining your customer relationships. You can easily put our years of experience and the latest technology to work collecting on your past due accounts. The objective of any debt collection agency is to collect debts on behalf of their clients, while getting paid for it. This means that all collection agencies everywhere perform the same service for a fee. The only thing different are the methods used to perform the service. Deciding to use a collection agency to recover outstanding debts from customers may not be something you’re excited about doing; however, there comes a time where this route becomes necessary for your small business to succeed. Therefore, debt collection services can strongly encourage clients to pay up, and will increase your chances of recovering funds from customers without too much effort on your part. Although you want a company who has a reputation of getting paid, you don’t want to go with an agency that has been known to harass customers and break FDCPA laws in order to collect debts, as this can reflect poorly on your business. We always work to maintain a positive relationship between you and your client while effectively collecting past due accounts. When Do I Need to Hire a Debt Collection Agency for my Small Business? As a small business owner, you do need to implement a process for figuring out which clients and customers fall into the collections category. For the most part, you don’t want to wait too long to call us. We can help you determine the most effective route to collect the outstanding client debt, which sometimes includes considering litigation. Remember, even if you have only one account, it can be collected on. Plus, having a collection agency at your disposal for future past due customers will allow for quicker placements, which gives you a better chance at recovering 100% of the money owed to your company. If your non-paying or slow-paying customers avoid your attempts at communication and seem to have fallen off the face of the earth, it might be time to hire a debt collection agency. Many small businesses are uneasy seeking help from a collection agency to settle slow paying or delinquent accounts. When you select a collections agency, you want to make sure it has all the features you company needs to recover money from delinquent accounts. Such services allow business owners to continue focusing on day-to-day operations and keep them from having to constantly pursue payment for unpaid B2B debts. Call us today to talk about how we can streamline the collections process for your company and increase your cash flow on uncollected debts. 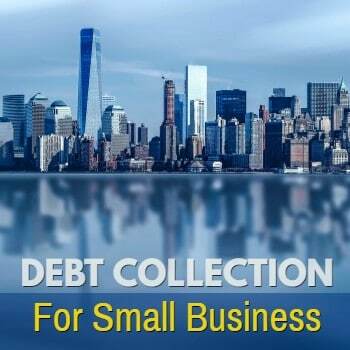 Interested in Debt Collection Services for Small Business?